Just before Wiggle’s first birthday we started sleep training because I was ready to get more that 3 hours sleep at a time. The first step was setting a routine (and sticking to it!). I have read countless studies showing the benefits of reading to your children every day. For this reason, we made story time a part of our nightly routine. Story time is followed by song time. 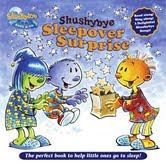 When I was offered an opportunity to review the new Shushybye Sleepover Surprise book with song CD, I jumped at the chance because it incorporated both the story and song time of our routine. Shushybye: Sleepover Surprise is a bedtime picture storybook that includes a CD with music kids love. The best part is, it’s the kind of music that parents find themselves singing along with, too. Shushybye is a land where its inhabitants (the Shushies) make magical dreams for little girls and boys. The catch, of course, is if you want to dream you have to go to sleep. Shushybye Sleepover Surprise was my first experience with the Shushybyes and I think they are adorable. The Shushybye dolls are so cute. The front and back covers of the book are glow in the dark and the CD is a great bonus. Wiggle Bean is still a bit young for a book of this length so we only make it through the first song (which I already have memorized) and maybe 5-8 pages of the book before she gets restless. I read through the book on my own and it is a great story. I like that you can put in the CD and follow along with them reading the story (great for when your voice is just not up to a full story reading) or you can read the story at your own pace. Over all, it is a great book and I love the song and read along features of the included CD. My only complaint (and it will not be a problem once Wiggle is a little older) is that you can not fast forward the CD. It would be nice to jump ahead to continue on where we left off the night before. Again, this will not be a problem once she is big enough to sit through the entire thing. Want to See the Shushybyes Live? The Shushybyes Live Summer Dreamin’ 2010 Concert Tour Featuring Michael North Performs Saturday June 12 In Washington DC At Jammin’ Java, The Bronx Zoo On Sunday June 13 and World Café In Philadelphia on Saturday June 19! The full line of Shushybye products (and the only place you can get the New Shushybye Dolls) can be purchase from the Shushybye Shoppe. You can also get a number of the books and CD’s at Amazon. Also, Walmart carries the Bedtime Stories and Songs DVD. Thanks to Shushybye and The Product Review Place , one Over Thirty Mommy reader will win a copy of The Shushybye Sleepover Surprise book and CD! This giveaway is open to U.S. addresses only. You do not need to be a blogger to enter, but you must have a valid email address and be age 18 years or older. Visit the Shushybye website and leave a comment letting me know what your favorite Shushybye item is . Subscribe to Over Thirty Mommy via Reader or email. Grab my Blog Button, let me know in your comment where I can find it (3 entries). Please leave a separate comment for each entry. Good luck! Winner will be chosen via a Random Drawing. Winners that I am unable to contact or one who does not claim their prize within 72 hours of being sent their winning email notification will forfeit their prize. I love the ZEEZ plush doll! I like the Snoozles doll! The dolls are cute but I like the: The Shushybye Dream Band: Close Your Eyes. Thanks. The Shushybye doll is my favorite item. All three of them look so cute. I like the girls pj set. I love the dolls! How cute! The sleepwear is too cute!! I love the girl’s shushabye sleepwear, very cute! I like the dolls SNOOZLES, DOZIE and ZEEZ. The colorful and fun-filled debut Shushybye bedtime storybook comes with an audio CD with the entire story narrated by Shushybye’s official storyteller Kenny Curtis and the Shushies! Plus, three original Shushybye songs including the rockin’ “Close Your Eyes”!! This is what I love and I may get it . This is a great idea for my little one as we are trying to get her in her own bed. I love the dolls! My son loves the shushys we watch it on BabyFirstTV regularly :). I think the Shushbye boys sleepwear is so cute.